The Gulf Coastal states offer mild winters, warm summers and full-sun conditions that citrus fruits need to thrive. Because of this, you can find citrus growing throughout these states--including Louisiana. In Louisiana, oranges, limes and lemons aren’t the only citrus cash crop. According to Louisiana State University, the state also exports citrus fruit trees to states such as South Carolina. Citrus orchards are relatively easy to start, which is why many citrus producers in Louisiana are small-scale and part-time growers. Select a location for your citrus tree or orchard in full sun and well-drained soil. Citrus trees will develop root rot in poorly drained soil. Each tree should have a 30-foot radius around it to develop properly. Test your soil up to six months before planting fruit trees. Louisiana State University maintains a soil testing facility in conjunction with their extension program. An agent in each of their parish extension offices can instruct you on the proper method for taking soil samples, as well as how to package them, fill out paperwork and submit the samples. Some fees apply, and typically soil test results are returned within three weeks. Break up the soil for your tree with a rototiller, and remove any rocks, sticks or debris that you encounter. You can break up the land for an orchard with a disk plow. Spread soil amendments (recommended by the test results in step 2) over the soil in a 4-inch-thick layer. Typical soil amendments include organic material such as peat moss, compost and manure, to improve nutrients in the soil, as well as drainage; and sulfur, to lower soil pH. Citrus likes slightly acidic or pH-neutral soil that ranges from 7.0 to 7.5 pH. Mix the amendments with the soil using your tiller or plow. Pile up soil into mounds 12 inches higher than ground level, to help increase drainage in the soil. 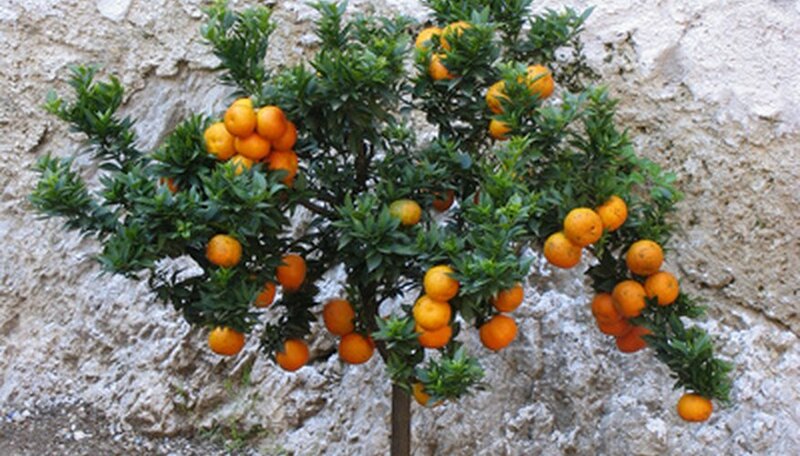 Time your citrus tree planting for January or February. Select a 4-foot-tall tree sapling with three or four well-developed side-branches. The lowest branches should be no less than 18 inches from ground level. Dig a hole in the ground for your citrus tree’s root ball that is twice as wide as the tree’s root ball, but no deeper. Place the tree’s root ball in the hole and cover with soil. Check the tree’s soil weekly until the roots become established. Water the tree so that the soil remains as damp as a wrung-out sponge. Fertilize your tree once yearly in January or February with a balanced, 10-10-10 granulated fertilizer, by spreading the fertilizer around the tree’s drip line in a ring. Apply 1 lb. of fertilizer per year of the tree’s age, up to 12 years. Prune trees to thin a dense canopy and allow light into the canopy. All other pruning should focus on removing branches that are diseased, rub one another or cross through the central canopy of the tree. Cut all limbs flush with the main trunk at the point of attachment. Cultivate shallowly under trees to remove grass. Do not mulch beneath trees. Spray citrus trees to protect them from pests and disease. Treat trees with copper fungicide, then cover trees in winter to protect them from frost. You can also place light bulbs near the trees, bank around the roots and wrap the trunks during sudden cold snaps in winter to protect the trees from damage. Citrus trees will die if temperatures drop below 20 degrees F. Remove all coverings and banking dirt in early spring.